Every team has players who always do less than they are asked; still others who will do what they are asked, but no more; and some who will do things without anyone asking. What every team needs is more of the third group, players who serve to inspire those around them to do things that will make the team better. These are the players who constantly renew their commitment to being their best for the team and whom others would do well to model. A fun and energizing environment is much more productive than a routine and stale environment. Student-athletes who enjoy their sport and their teammates come to practice with moare energy—more passion. And this can be contagious. the successes and accomplishments of your teammates. Make it a daily goal to point out the strengths and contributions of those around you. 1. Keep Your Fire Burning. Fill your energy tank frequently. Your teammates feed off your fire. Avoid burn-out by regularly relaxing and refreshing your mindset. 2. Take Charge of Your Moods. Recognize your present mental and emotional state and take time to reflect on how your attitudes impact and influence your teammates. 3. Listen to Teammates. Spend time with your teammates and attempt to understand their feelings, perspectives, and experiences. Make it a way of life rather than a onetime event. 4. Be There for Others. Team building is about recognizing, respecting, and appreciating your teammates. Your friendship can be just the encouragement a teammate might need to make it through a challenging time. The smallest gesture, a simple act of kindness, at just the right time can make a big difference. 5. Act with Integrity. Blaming, finger-pointing, and accusing others will lead to negative reactions. Do what you say you will do. In other words, walk the talk. Your attitudes and actions should be consistent with your words. 6. Be Genuine. Your teammates will see right through you if you are phony and superficial. They want you to care about them and help them achieve their goals. Belief in your teammates will breed trust and healthy relationships. Point out others’ strengths and contributions—daily! 7. Refrain from Excuse-Making. Players that are committed to excellence identify what top-notch performance looks like and then take action steps towards that standard, never making excuses for disappointments and failures along the way. 8. Mend Broken Fences. Great teammates are those willing to admit mistakes. Durable and enduring relationships are built by pushing through adversity. Conflict is natural. Restore relationships where conflict has caused tension. Be patient, persistent, and pleasant when restoring a relationship. 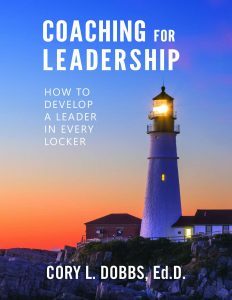 Dr. Cory Dobbs is an accomplished researcher of human experience–a relentless investigator always exploring “how things work.” He is the founder and president of The Academy for Sport Leadership and A Leader in Every Locker and has written extensively on leadership development of student-athletes.